DESCIPTION This two bedroom link detached bungalow occupies a popular village location and stands within two miles to Prestatyn’s main town high-street shops and public services. Offering surprisingly spacious accommodation with a large lounge, kitchen, bathroom, separate W.C and two bedrooms. Having a garage facility with gardens to the front and rear of the property, it boasts gas central heating and double-glazing. The accommodation is certainly worth inspection. HALLWAY 14′ 0" x 3′ 7" (4.27m x 1.10m) With radiator, power point and access to roof space. 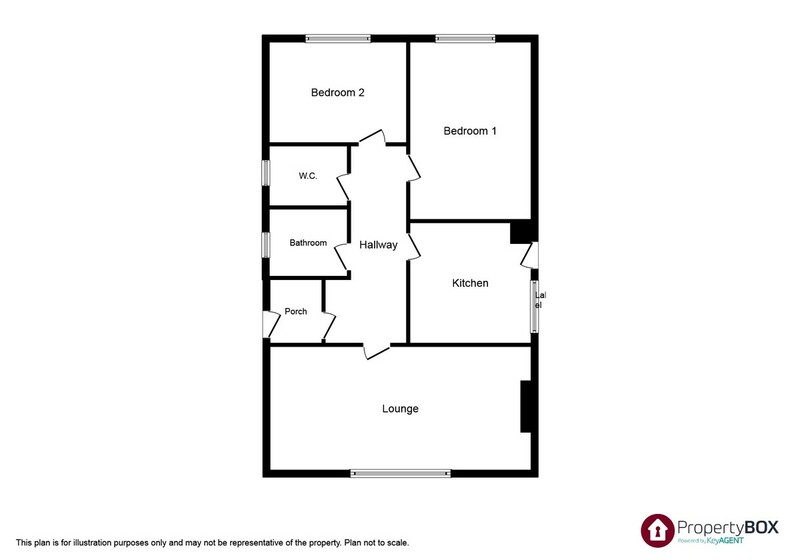 LOUNGE 21′ 7" x 11′ 9" (6.58 (max)m x 3.60m) With radiator, tiled feature fireplace with a living flame gas fire, power points and double-glazed window giving aspect over the front of the property. KITCHEN 11′ 6" x 10′ 3" (3.51 (max)m x 3.13m) Having a range of wall mounted cupboards, base units and drawers with work top surface over. Single drainer sink unit, plumbing for automatic washing machine, radiator, power points, double-glazed window to the side of the property and double-glazed door giving access to the side driveway. BATHROOM 5′ 9" x 5′ 4" (1.76m x 1.65m) Having a two piece suite comprising a panelled bath with shower over, pedestal wash hand basin, part tiled walls and heated towel rail. W.C 6′ 0" x 3′ 0" (1.84m x 0.93m) Having a low flush w.c and part tiled walls. BEDROOM ONE 16′ 11" x 11′ 6" (5.17m x 3.53m) With double panelled radiator, power points and a double-glazed window which enjoys views to the rear of the property. BEDROOM TWO 12′ 10" x 9′ 7" (3.92m x 2.93m) With radiator, power points and double-glazed window giving aspect over the rear of the property looking towards Meliden hillside. OUTSIDE The property is approached over a driveway leading to an attached garage with an up and over door, paved gardens to the front with surrounding beds. Gardens to the rear consist of a large paved patio area with lawn adjoining, timber constructed garden store and the gardens are bounded by timber fencing. The rear gardens enjoy a stunning outlook towards Meliden hillside. DIRECTIONS From the Prestatyn office proceed along Meliden road, turn right at roundabout, first left on to Fforddisa, continue to the crossroads and turn left towards Meliden, take the right turning on right into Roundwood avenue and the property can be found on the left hand side.